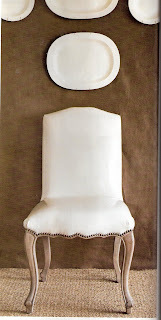 I adore the chair, but never thought about serving heads on a platters... photographically, it could be iconic! Agreed. A well-edited room is just as lovely (and difficult to achieve) as a room layered with patterns and froth. Brown and a soft white look so great together. I like the sisal (?) rug too it add a nice complimentary texture to the soft brown. anonymous, that is something I wouldn't have thought of but it is funny!! LOVE this! Especially because it is patent leather. Isn't this just gorgeous? I loved all three chairs, especially the one with Michael Smith's fabric. But this is a standout and what a great way to have white without slip! I love your blog, btw.